We are immensely grateful to the Mayor and Lady Mayor of Wokingham for their tireless efforts during 2018 in support of the Reading Bladder Cancer Support Group. As a result of their fundraising, we have benefited by over £9,000! Our thanks go to the local Sikh community who collected cash on our behalf during the Vaisakhi celebrations and raised £1200, we are very grateful for their donation. 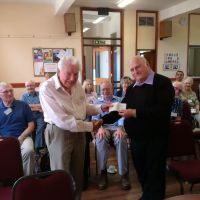 Here's a photo of our chairman Rob handing over the cheque to our treasurer, Ken. Kevin's Dad is one of our members so Kevin put himself through many weeks of tough training to run the Reading Half Marathon which was subsequently cancelled due to snowy conditions. Kevin will honour his commitment to run at a later date and in the meantime, he has raised £1155 which with gift aid, totals some £1370. Thank you Kevin, we much appreciate your efforts. 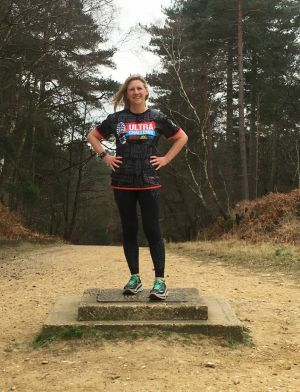 Rebecca Margetts as pictured above in training for the Isle of Wight marathon. Rebecca kindly agreed to run on behalf of the Reading Bladder Cancer Support Group and raised a fantastic £2509.50! Well done to Rebecca and many thanks from the group. Many thanks to Anne and Derek for opening their garden to friends and neighbours. As a result they have raised £410 for our group. Total Raised £1,015.00 for the Reading Bladder Cancer Support Group. Many thanks Janet ! Mike Bowerman -"Back to the Trenches"
Mike raised £339.50 in this very arduous event. The group is extremely grateful for Mike's efforts.